Electric pocket bikes (also known and electric mini Bikes) offer the opportunity to experience the feeling of a motorcycle ride without the hassles and the danger sides. They have been around since the 50's and electric versions have started to showed up in recent years. Electric pocket bikes are basically an electrified small version of ordinary motorcycles, a mini-motorcycle. Some of them look just like their full sized motorcycle brothers, just small. 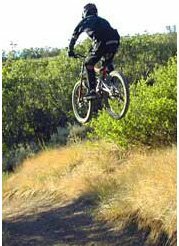 They offer a unique riding experience, a lot of fun and an affordable dose of adrenaline. They run completely on electric power. This means these bikes will run without the cost and the hassle that gasoline pocket bikes require. In the past couple of years, so many models of electric pocket bike has appeared that its difficult to know where to start looking. Today pocket bikes have all the high-end parts of motorcycles. Disk brakes, sophisticated frame design, high quality tires, variable speeds, etc. Electric mini bikes are extremely quiet as opposed to the gas powered ones. As a whole, gas powered pocket bikes are faster then the electric bikes. But, electric pocket are still in there infant steps, as is all the electric vehicles industry. But technology improves fast so there is a change that electric mini bikes could win the speed crown in the near future. Pocket bikes are affordable. Gas pockets bikes offer more speed and higher performance for about the same price or slightly more. But if electric pocket bikes will start to be mass produced, the price will start to run down. Also, technological improvements will help also to bring the prices down. Which requires more maintenance and more long term costs? In the long run, an electric pocket bike is much more affordable to use then gas pocket bike. The cost to charge the pocket bike is peanuts compared to the cost it takes to fuel a gas pocket bike. Moreover, the gas pocket bike require much more maintenance than the electric version because of all the moving parts and the oils. Which has more types choices? There are much more gas mini bikes today but it may change in the future as the electric mini bikes industry will start to grow up. Also, there are more gas types that are suitable for different terrains and avenues. Also, if you have interest in bike racing, you will find much more gas powered bikes but if you need affordable pocket bikes just for fun, there are plenty of electric bikes for you to choose from. Electric pocket bikes are more environmentally friendly than gas pocket bikes. They are exhaust free, produce no smell and much more quieter. You can even use them in indoor tracks. Which one offers more range? Gas is going to give you more range. An electric pocket bike can travel for about 15-25km on a single charge. That's not a lot, but it's enough for a fun ride around town and a couple of race rounds. Unlike a motorcycle, it is easy to store, pick up and carry the e-pocket bike to just about everywhere and anywhere because of it's small size and low eight. They won’t take up much room in a garage, and they are able to fit in the trunk of a car. Shipment and mailing is also very easy and cheap so buying an electric mini bike online is not a problem. But, be cautious and careful about buying online. Generally, people from all ages can ride electric pocket bikes. Even though they are small, riders up to 180cm and up to 80kg can usually use them without any risk and have a lot of fun. Be sure to know the exact limitations of the e-pocket bike you are looking at. Slight variation exists between different models. So although pocket bikes are normally aimed for children. Adults can also enjoy riding them. It won't feel less comfortable to a grown-up then a children. Kids age 8 and younger to adults age 50 and older can have a lot of fun riding this kind of bike. They are prefect for beginners and also for father and child quality time. Also, the responsibility of holding and maintain a real motorcycle or even a gas pocket bike is not necessary in this case, so young people can handle it quite easily and with minimum money spending. 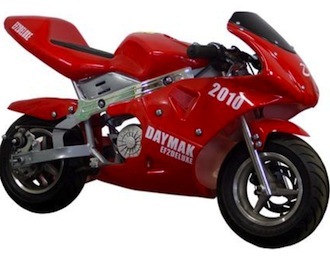 Electric pocket bikes may be the answer to a young person who enjoy riding motorcycles but can't ride them legally, don't want to put a great deal of attention and care and avoid dangers such as gas leaking in a case of a collision.